Lately, we have been eating at Denny's a fair bit. It seems to be a friendly place for a family to go for a breakfast. 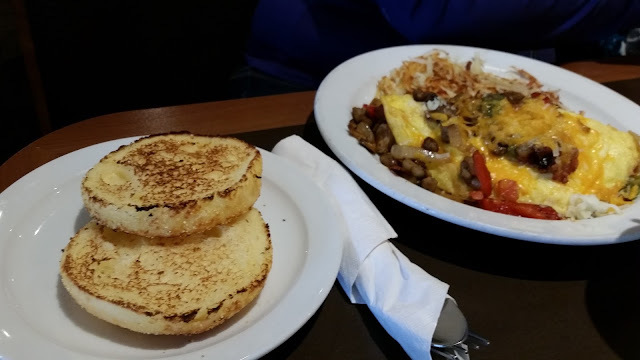 There are not a ton of gluten free items available on the menu, but Amanda loved ordering an omelet with pan fried hash brown, or sometimes an egg skillet with sausage. The last time we went, we found out that Denny's has added a gluten free English Muffin for 99 cents. 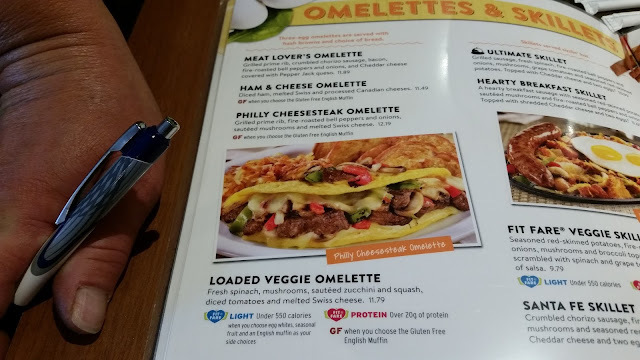 It just popped out on the menu for Amanda under the omelette section. Funny how the letters GF can appear to those who may be looking but to those who aren't it likely just goes completely unnoticed. So for an extra 99 cents, of course Amanda tried the gluten free English Muffin. A few things to think about. The muffin would share a toaster if you asked for it to be toasted. Amanda asked for it toasted, without thinking to ask about cross contamination precautions. So be sure to ask for it to NOT be toasted. The English Muffin also looks to be corn based. I know a lot of people always ask if something contains corn. We forgot to ask who makes the English Muffin, but they get their supply of regular bread from McGavin's, who does carry gluten free products from other people at their open bakeries. Amanda thinks that the GF english muffin looks similar to the one from Glutino, but we are not entirely certain. Amanda really enjoyed the English muffin. She just scraped the muffin as much as she could in hopes of wiping off contamination and now we know for next time, you need to and can ask for it NOT to be toasted as there is a shared toaster being used. I tried one today at Denny's in Calgary. Was tasty, but it spiked my blood sugar as much as a regular English muffin does, so its likely made with corn, which of course takes us into GMO's. According to FitnessPal it has 29 grams of carbs, 1g being fibre. Haven't found much more information about it. Im not Celiac but a type 2 diabetic and I just feel better avoiding wheat.